What Church of Ireland records survive? What genealogical details do they hold? 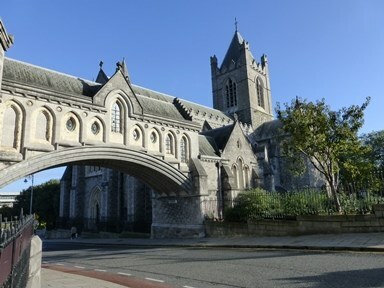 Christchurch, one of two Church of Ireland cathedrals in Dublin. The other one is St Patrick's. 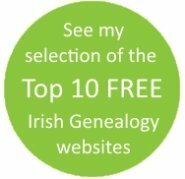 To trace ancestors in Church of Ireland records you need to know the townland or parish where they lived (see Hunt the Townland page). Assuming you have this information, you'll need to appreciate the availability (or lack of it) of surviving parish registers. The good news is that Church of Ireland registers generally start a lot earlier than those of most other faiths in Ireland. This is because it was the Established or State Church and, as such, was legally obliged to keep records. Until 31 December 1870, the Protestant Church of Ireland was the Established (State) Church of the island. The Church of Ireland is a Protestant Church that was, until 31 December 1870, the Established (State) Church of the island. This obligation dated back to the 17th century when baptisms and burials of Irish Protestants started to be recorded. This process began with urban areas and gradually spread out to the surrounding countryside but it was more than 100 years before some rural parishes were created. This is why the majority of registers don't begin until the late 18th or early 19th century. And now the bad news. More than half of all Church of Ireland registers were destroyed in the 1922 fire at the Public Records Office in Dublin. Ironically, they had been ordered to be sent there for safe keeping. That order had been made in 1876, a few years after the dis-establishment of the Church of Ireland. All its old registers, being state records, had to be sent to the Public Record Office unless the local clergy could demonstrate that they had suitable safe storage for them. Nearly 1,000 parishes decided to comply with the order to surrender their original registers to Dublin. Fortunately, some clergymen made transcripts before parting with them. Another 637 parishes did not comply with the order and those registers survive. 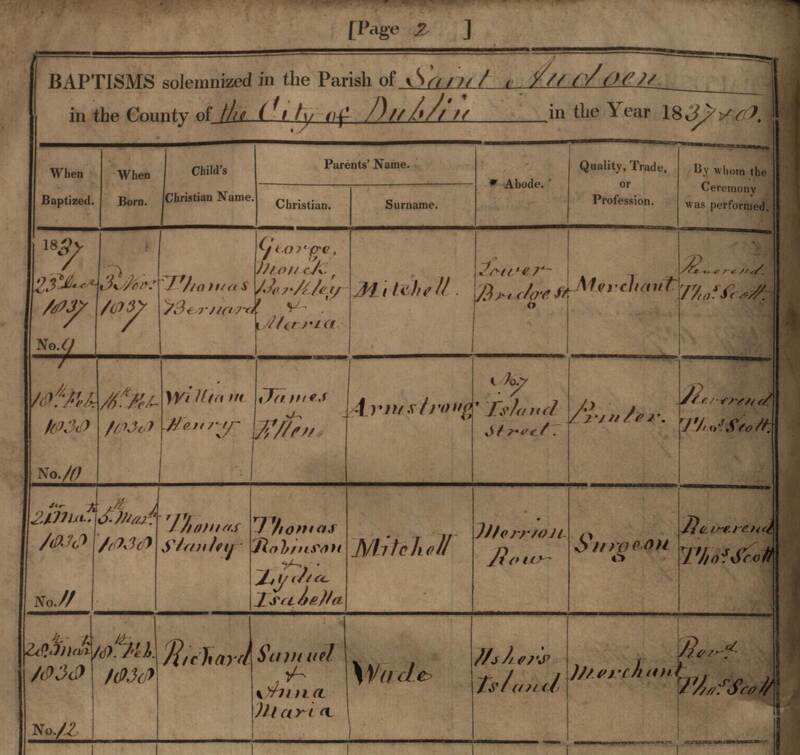 Irish baptism records: Church of Ireland baptism registers usually give the child's name, the father's full name and at least the mother's first name. In most cases, the mother's maiden surname is not provided. Sometimes a townland or urban street name is included. 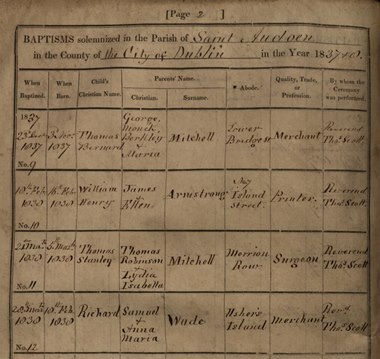 St Audoen's 1837 baptism register. Click for larger image view. After 1820 it became more common for the clergy to record the father's occupation and the child's date of birth. The latter can be an important addition because some families waited several months to baptise their infants. Marriage records: A typical entry in an early marriage register would record the full name of the groom, the full name of the bride, the date of the wedding and the name of the officiating clergyman. And that was it. Burial records: The majority of Church of Ireland clergymen also recorded burials as well as baptisms and marriages. Burial registers usually give the name of the deceased and date of burial. Sometimes the residence of the deceased (ie the townland) is provided, and sometimes the deceased's age. See the main Church Records page for an overview of parish registers (all religions). You may be able to trace your ancestors in Church of Ireland registers even though they were not practising Anglicans. Penal laws made compliance with the Established Church a sensible move for many Irish men and women, even if their true beliefs were practiced in private elsewhere. The minutes of parish meetings sometimes contain interesting snippets or surprisingly candid comments that can be of value to family historians. Some even contain notes of baptisms, marriages and burials, along with information additional to that contained in the official registers. To trace Church of Ireland ancestors in these records can be tricky because the vestry books, like the registers, are not held in one place. Some are at PRONI, some are at RCBL, some are in local custody. And some are on the NAI microfilms. All contact details and links can be found in the main text of this page.